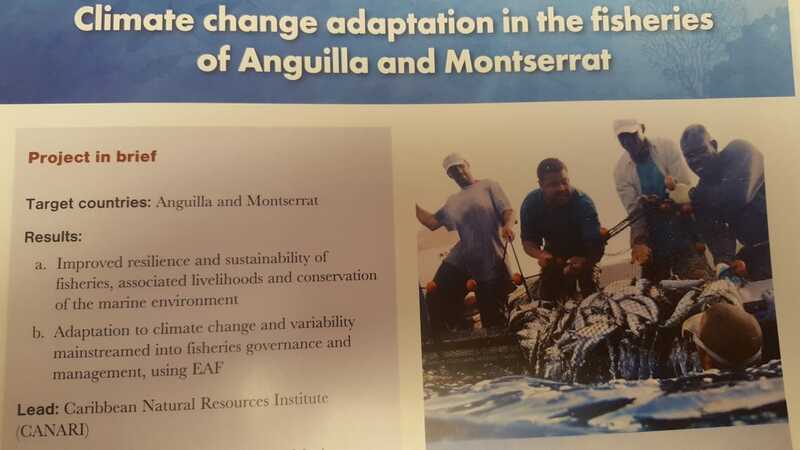 Climate change adaptation in the fisheries of Anguilla and Montserrat. CANARI is working in partnership with the Department of Fisheries and Marine Resources – Anguilla, Fisheries and Ocean Resources Unit – Montserrat and the Centre for Resource Management and Environmental Studies of the University of the West Indies to implement a 3-year project Climate Change adaptation in the fisheries of Anguilla and Montserrat. The CANARI representatives will be holding a 4 day workshop at the Montserrat Cultural Centre conference room with government agencies, civil society organisations and private sector representatives to integrate Ecosystem Approach to Fisheries (EAF) in fisheries plans land policies and to work with the fisher folks and their organisations to build capacity for EAF land stewardship of coastal and marine resources, and also to consider similar initiatives that may be supported through small grants.